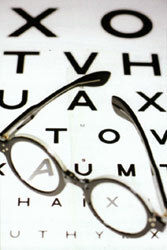 Welcome to Davis Optical & Family Eye Health Center! Our practice proudly serves the North Seattle and Eastside area with a tradition of quality service and a friendly staff. Drs. Ron Coverdale and Diana McFarland take great pride in offering every patient the absolute best in vision care—whether through fitting them with eyeglasses or contact lenses, diagnosing cataracts, glaucoma, and other eye diseases, or recommending LASIK and other eye surgery procedures. Built on the foundation of patient convenience and satisfaction, Davis Optical & Family Eye Center serves all of your family's eye care needs under one roof. Come visit our modern facility and friendly doctors and staff! The mission of Davis Optical and Family Eye Health Center is to serve our patients by providing the highest quality professional eye care and products in order to enhance their quality of life. We are committed to achieving excellence in the care we deliver in an atmosphere of uncompromised integrity, service, value and compassion.